I love my son more than words can describe and I have so much fun with him every single day. And as a former teacher, my patience runs pretty deep. However, parenting is hard! And patience runs out, emotions run high, we run out of ideas for fun things to do, we need something to lighten the mood or encourage silliness. I have found that MUSIC makes all the difference in the world for me and my son by filling our moments and days with so much joy, even during times that might normally be frustrating. Music is a big part of who we are, and our lives are the better for it. I’d love to share how we work music into various parts of our day! 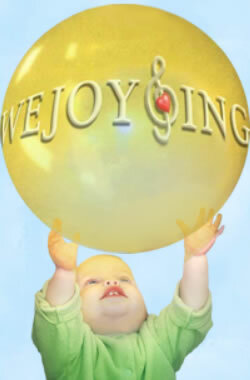 (Songs my son and I have learned in WeJoySing are in bold). My favorite songs are those that the words identify or label what we are doing! For example, think The Little Rascals. Instead of singing “I’ve got a dollar, I’ve got a dollar, I’ve got a dollar hey hey hey” substitute “washing our hands, washing our hands, washing our hands hey hey hey.” Or to the tune of BINGO “There was a boy with blonde hair and Breck was his name-o, B R E C K…” Or to the tune of Do You Know the Muffin Man “We will change your diaper now, your diaper now, your diaper now…” I would love to hear other examples of how you all do this at home! Read books that are songs: Some of our favorites include We All Go Traveling By, Pete the Cat’s Old Macdonald/5 Little Ducks/Wheels on the Bus/Old Macdonald, Over in the Meadow, Twinkle Twinkle Little Star, Five Little Monkeys, Ten in the Bed, Down by the Station. Get your child a CD player: My son has his own that I’ve taught him how to use. Kids catch on SO QUICKLY. He knows how to switch cd’s and search for songs he loves! My hope is that this post inspires you to incorporate music into your family’s day in new ways and gives some ideas if you’re looking for new songs, or just need reminders of old ones you’ve learned in WeJoySing or sung before!